You have (probably) not held a PS4 controller yet. Neither have I. But Shuhei Yoshida has. He's the head of Sony's worldwide studios, so he better have! Yesterday, I had to rely on him to tell me what the controller feels like. 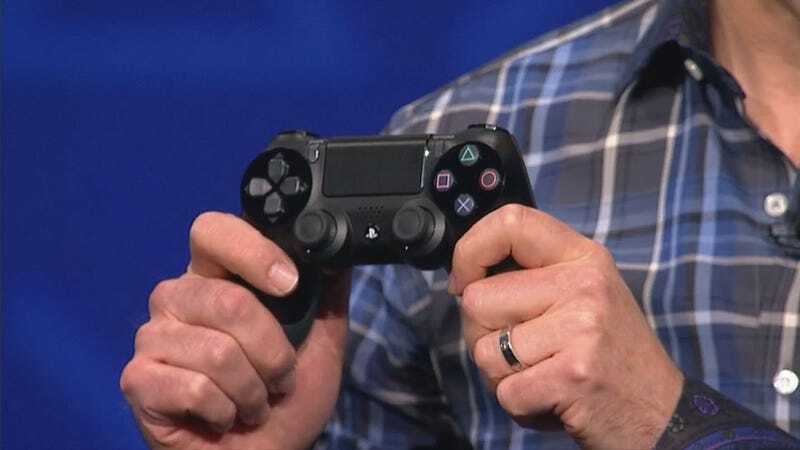 Sony, you see, wasn't letting reporters touch the new PS4 controller—the DualShock 4. They didn't even let us look at them, taking them off-stage as soon as they weren't needed for live demos. The DualShock 4 retains the dual-analog, four-trigger, four-main-face-button and d-pad design of previous PlayStation controllers. But Sony has added a touchpad. We've reported on it before, describing, as Sony's official documentation for the thing notes, that it is clickable and supports two points of touch. But what does it feel like to use it? And how exactly should we think of using it? Me: Is the touchpad a thing for my thumbs? For me to reach in to touch it? Or is it for me to take my hand off one of the controller's prongs and use it with my pointer finger? Yoshida: Both. Having a touchpad or touch input we really wanted to do because, these days, all these devices have touch control. Instead of trying to replace buttons or sticks with touch we thought that some things cannot be done as well as they can with a touchpad—like swiping or pinch-to-zoom. These functions are easier to do with multi-touch. But we didn't want to make the main control with sticks and buttons more difficult. We really focused on making this basic stuff better… We worked on that first and then looked at what space we had left to incorporate this. Me: To scroll and things like that? Yoshida: Yeah. Or some applications, you might want to put the controller down and use the touchpad like...the touchpad on the PC. We are thinking about other ways to use it. Yoshida cited improvements here, too, comparing the DualShock 4's bigger analog triggers with the relatively shallow ones from the PlayStation 3's current controller: "It's more concave," Yoshida said. "And it has more play. On the DualShock 3 it's hard to use L2 and R2 the analog way. It's ‘press down' or ‘not press'. But with the DualShock 4, you can do something in between." He said the shape might feel like the T-button on the PS Move controller. I suggested it might also feel a little more like the Xbox 360 controller. Cue chuckles. Yoshida's a good sport. The DualShock 4 has two analog sticks, of course. They look the same, but there are some invisible, tangible differences. Yoshida: It's improved in terms of precision. The center area is more useable. When you try the games, you'll notice you have better, more subtle control when you're driving. Me: Are you saying there's less of a dead zone in the middle? There's more range? Me: Small motions will be detected better? Yoshida: Yeah, you'll have more, tighter control. The controller will also include a speaker, a light bar, and a share button. The speaker emits mono sound and seems to crib the concept from the Wii Remote. The light bar, according to Sony's press releases last night, "illuminates to match the color of characters in a game to offer a simpler, more friendly way to identify players, even when playing side by side. The light bar also changes patterns during gameplay to provide useful information to gamers, such as when a character is critically low on health or has taken major damage." The share button is a very big deal and will let you share clips of games you're playing on the fly, among other things. "gamers can charge DUALSHOCK®4 while PS4 is on standby." My god, people. We are living in the future! Note: the top picture is not actually of Yoshida holding the controller. Those are Mark Cerny's hands.